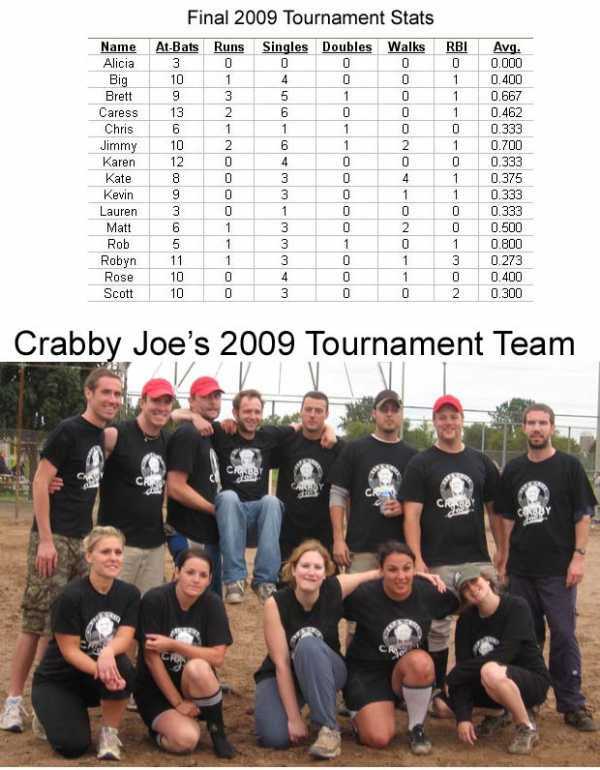 The best season in Crabby Joe's history ended in a heartbreaking fashion. We dominated out of the gates starting 2-0 (our 1st tournament wins ever!) then crumbled dropping the final 2 games and being eliminated by a tie-game earlier by 2 other teams. We still despite the ending had our BEST season ever! We added new talent and our improved defense had us competing in every game. I love managing this team and look forward to the chance again next season. Thanks to everyone who showed up each week and COMMITTED to the team. I appreciate it. Thanks to our Dennis our new "go-to" guy at Crabby Joe's in Chatham. He put up with us EVERY Friday for 4 Months! Mmmm....$4 Martinis! Hope to see everyone out on the field again next season. Enjoy the off-season. Brett. Final Score: Crabby Joe's 4 On the Edge 2. At the plate Rob had a double, 2 singles, 1 RBI and a run scored. Brett had a double and a single. Chris had a double and a run scored. Scott had a single and 2 RBI. Robyn had a single and 1 RBI. Matt had 2 walks and a run scored. Kate drew 2 walks. Jimmy, Kevin, Big, Caress & Lauren all added a single each. Defensively Kate made a spectacular catch on a deep flyball to Rightfield. Matt made a good catch in Right-Centerfield. Robyn made a good play at 2nd base to force a runner out. Caress & Lauren made good plays on grounders firing to Scott & Rob respectively at 1st base. Rob also caught a fly ball that was well hit. Brett pitched 9 innings allowing 2 runs on only 5 hits, while walking 2 and striking out 5. In what was the muddiest game in Crabby Joe's history Crabby Joe's won over Get 'R Done by a score of 4-1. For those who played in this 'Classic' they will never forget the rain and the condition of the field! It was quite the scene. At the plate Jimmy had 1 double, 1 single, 1 walk and a run scored. Big had 2 singles, 1 RBI and a run scored. Kate had 2 singles, 1 walk and 1 RBI. Kevin had a single and 1 RBI. Brett & Caress had a single and a run scored each. Karen & Rose had a single each. Robyn also added 1 RBI. Defensively Big made a fantastic running catch (while it was raining)in Left-Centerfield with a full raincoat on that was reminiscent of Bruce Willis in Unbreakable! Brett & Kate combined for two force outs at 2nd base. Robyn & Caress were awesome on multiple grounders that were hit their way. Brett & Karen also combined for an out at home plate! Robyn pitched all 6 innings allowing 1 run on 7 hits, while walking 2 and striking out 3. Final Score: Crabby Joe's 2 Encore 7. Offensively Big & Scott had a single each. Jimmy, Matt, Karen & Kate had 2 singles each. Kevin had a single and a walk. Brett & Caress had 2 singles and a run scored each. Robyn & Kate each drew a walk. Defensively Jimmy made multiple fly ball catches in Left-Centerfield and Rose made a key out at home plate. Robyn started and pitched 4.2 innings allowing 7 runs on 6 hits while walking 8. Brett closed pitching 2.1 innings allowing 0 runs on 2 hits while striking out 2. Final Score: Crabby Joe's 3 Encore...Again 4. We had a chance in the bottom of the 7th to tie the game - runners were in scoring position but it was not to be. Offensively Jimmy had 2 singles, 1 walk, 1 RBI and a run scored. Robyn & Caress had 2 singles and 1 RBI each. Brett & Scott had a single and a run scored each. Rose had a single and drew a walk. Chris, Rob, Matt, Karen & Kate all had a single each. Brett pitched all 9 innings allowing 4 runs on 9 hits while walking 2 and striking out 1.